It is generally assumed that Yang Biaozheng created both the words and the music of this piece, but this is not completely certain. The preface and the lyrics both refer to Yang in the third person but the narrator of both also uses the pronoun "I". Meanwhile, the events described in the lyrics are somewhat different from the events of the preface (both the 1573 and 1585 versions). 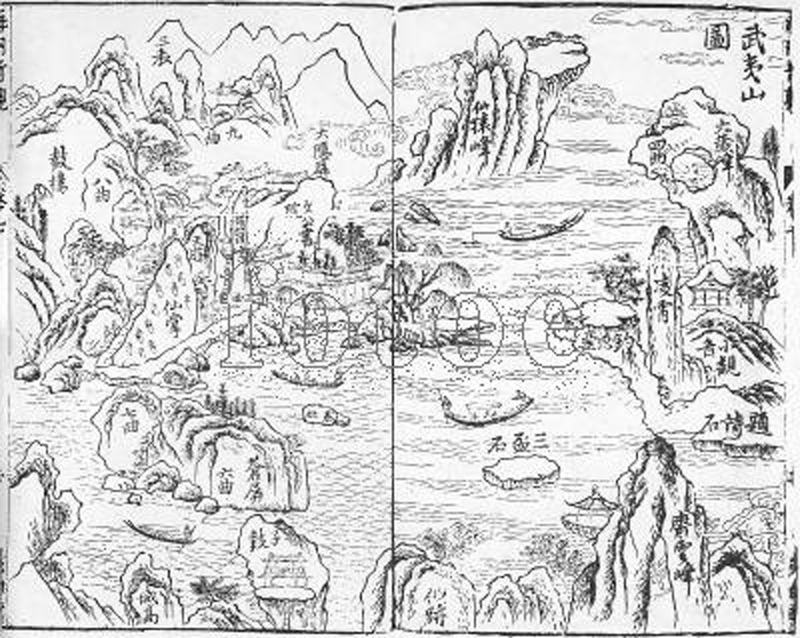 The prefaces4 tell of Yang and a Daoist friend named "Ning'an"5 traveling to the Nine Bends Stream of the Wuyi Mountains,6 where they hope to find an immortal. Passing the White Jade Toad Cave7 they come to the Huiweng Academy.8 On the cliffs above there is a cave that has written on its gate, Cave of Mysterious Origins,9 and here they find the "Immortal", a man with white hair but with the complexion of youth. They spend some time together in conversation and the visitors seem to come away very impressed. As they leave they are presented with "ancient airs" (old-style lyrics? ),10 then after they return home the narrator is inspired to express this through the qin. As for the lyrics, they tell of Yang Biaozheng taking his qin and going into the mountains to play there. They do not mention a specific place, or going there with friends, but he does seem to meet a "mountain man" there. Then, while they (or just Yang) play qin, there suddenly emerge resonating sounds ("like crickets") from nearby.11 Here qin is not specified, but the magical nature of the sounds is largely expressed by mentioning the evocative names of various well-known qin melodies. Both prefaces discuss the circumstances of the melody's creation; in this they both begin and end largely the same, but there are a few differences in the middle. In some places it may seem that the 1585 melody has been corrected from the 1573 one, but in other places the differences seem to be either developments on the 1573 melody, different versions of that melody, or simply a different melody altogether. A particularly noteworthy difference is that 1573 is more likely to use ornaments such as fast and slow vibrato (吟 yin and 猱 nao/rou), while 1585 much more commonly uses a simple "up down" (上下 shangxia) or "down up" (下上 xiashang). The lyrics are 7 character lines throughout, mostly in couplets but in two places there is an extra line. Differences between the two versions are small and not very significant - other than the fact that in 1573 they are all combined into one section, whereas in 1585 they are divided into five titled sections. The only attributions for Yu Xian Yin are all to Yang Biaozheng himself. However, none of these seems to specify whether this refers to the music, the lyrics or both. The setting is largely syllabic; the original text follows the lyrics section by section. Timings follow my recording (listen 聽我的錄音). Gongchuan (in Fujian) gentleman Yang Xifeng, especially carried (his qin called) Green Gossamer into the mountains. With his headcloth he resembed Tao Sajiu (i.e., Tao Yuanming), his elegant sleeves loosened by the light breeze. A mountain man sleeping soundly on a stone pillow, was startled by my crane dream of a roaming meeting with a wild goose. Host and guest on seeing each other seemed like old friends, and sat facing each other by a green screen in great harmony. 貢川居士楊西峯，特攜綠綺來山中。 Gòngchuān jūshì Yáng Xīfēng, tè xié Lǜqí lái shān zhōng. 葛巾一似陶灑酒，翩翩兩袖拖淸風。 Gé jīn yī sì táo sǎ jiǔ, piān piān liǎng xiù tuō qīng fēng. 山人枕石睡正濃，扣我鶴夢遊鴻濛。 Shān rén zhěn shí shuì zhèng nóng, kòu wǒ hè mèng yóu hóng méng. Then the servant boy fired up the pot, alongside soaring pines resembling old dragons. Dark gibbons and white cranes attended us left and right, seated cross-legged we had qin across our knees. When first placing fingers on the strings it was like wild geese roaming; "ling ling li li" we played The Transcendent Immortal. The seven strings harmonized with the melody. In harmony with our hearts the hands followed and myriad worries disappeared; finger sounds went "ding ding dong"
遂呼童子爇沉鼎，旁取巖松如老龍。 Suì hū tóngzǐ ruò chén dǐng, páng qǔ yán sōng rú lǎo lóng. 玄猿白鶴侍左右，跏趺兩膝橫絲桐。 Xuán yuán bái hè sì zuǒ yòu, jiā fū liǎng xī héng sī tóng. 初然下指若遊鴻，冷冷瀝瀝調仙翁。 Chū rán xià zhǐ ruò yóu hóng, lěng lěng lìlì diào Xiān Wēng. 隨心應手萬慮空，勾踢抹打玎叮(王冬)。 Suí xīn yìng shǒu wàn lǜ kōng, gōu tī mǒ dǎ dīng dīng dōng. Absorbed by what seemed like streams resounding over stone, suddenly we heard a melody like humming crickets. It was also like High Mountains or lofty Kongtong, and also like a solitary crane calling out at midnight. And also like in a Buddhist temple striking the morning bell. Paired clarity of wind and moon on a mid autumn evening; Dialogue by a Guest Window so leisurely. A Daoist does not indulge in overly emotional melodies, and especially plays of Fishermen and Woodcutters meeting by a river. 又如梵宇敲晨鐘。 òu rú fàn yǔ qiāo chén zhōng. 雙淸風月中秋夜，客窗對話何從容。 Shuāng qīng fēng yuè zhōng qiū yè, kè chuāng duìhuà hé cóng róng. 道人不喜悲傷曲，特弄漁樵江上逢。 Dàoren bù xǐ bēi shāng qū, tè nòng Yú Qiáo jiāng shàng féng. Sunny Spring and White Snow return us to antiquity, Spirit Wandering in Eight Directions amidst layers of mist and clouds. With restraint our hands move as we sit correctly in our robes, already forgetting things like others and self. Unrestrained topknots drawn along by liquid clouds, we pick "sparrows' tongue" tea by climbing to the spring clusters. (???). Dawn comes and as I leave I carry my qin and go, suddenly also separated from the land east of the immortals (Penglai and Yingzhou). 月瓢滿酌共啜罷，夜來同臥蕋珠宮。 Yuè piáo mǎn zhuó gòng chuài bà, yè lái tóng wò Ruǐ Zhū Gōng. Suddenly also separated from the land east of the immortals (Penglai and Yingzhou). Five sections; Guide 25/211/384 : only here. See under Transcendant Venerable One for more on the translation of "仙 xian". Gong is the name of the first string, and this is the tonal center. However, in this melody the relative tuning seems to be 5 6 1 2 3 5 6, making the main tonal center 5 (the note 徵 zhi). For more on this see Shenpin Zhi Yi as well as Shenpin Gong Yi and Modality in early Ming qin tablature. Now a Unesco World Heritage site. 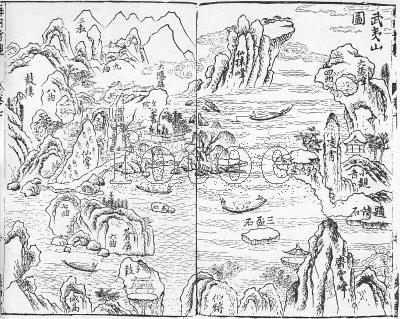 The image was copied from www.fotoe.co, which said the original dated from the Ming dynasty, "木版畫：《武夷山圖》局部，武夷山，位於福建武夷山市境內，1999年被聯合國科教文組織列入世界自然與文化遺產名錄。出自《新鐫海內奇觀》，明代楊爾曾撰，錢塘陳一貫繪，新安汪忠信鐫，共十卷，明代萬曆三十七（1609）夷白堂刻本。"
There are two somewhat different prefaces, from 1573 and 1585. Translation is still incomplete, but the original text is here. 39843.152 道契 daoqi gives three definitions but no usage as a nickname. Instead it seems to suggest some sort of Daoist relationship. 1752.69 has no 凝菴, only 凝庵 (also Ning'an), giving this as a nickname for and Ming dynasty scholar official named 唐鶴徵 Tang Hezhi (1538-1619; the 1573 preface gives the surname 張 Zhang, so presumably this is someone else). This would have been about 200km from Yang Biaozheng's hometown Yong'an. From Nanjing it was perhaps 700 km. 23191.96 says this is a name for 葛長庚 Ge Changgeng; 32168.41 葛長庚 says he was a man of the Song dynasty who studied the Dao in Wuyi Shan, so perhaps the cave was named after him. 朱熹 Zhu Xi, who was originally from Fujian, spent many years teaching in the area of the Wuyi Mountains. Still (or again) today Wuyi Shan 武夷山 has a number of buildings commemorating Zhu Xi, including his grave and a memorial hall. Gu Feng could be a title, but here it probably just refers to ancient lyrics or lyrics written in an old style. The first verse mentions a 山人 mountain man as well as 主賓, which I understand to mean host and guest. The second verse mentions a servant. The third verse speaks of melodies suddenly heard in the distance. 32654.7 "蕋珠：飾以花蕊珠玉之宮殿，謂仙境也。 Ruizhu: a palace embellished with flowerbuds and jewels, a precinct of immortals." There was a Daoist classic called the 蕋珠經 Rui Zhu Jing (Flowerbud Gem Classic, or Stamen Gem Classic) thought to have concerned immortality.